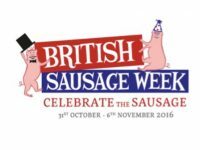 Multi-award winning Norwich butcher Jamie Archer, of Archer’s Butchers is celebrating British Sausage Week by teaming up with fellow award-winner, Candi Robertson of Candi’s Chutney, to produce the ‘Norfolk Nobbler’ sausage. The sausage is a combination of Archer’s traditional pork sausage, featuring locally sourced pork from Tim Allen in South Creake, and Candi’s Parsnip & Chilli Chutney, along with a touch of the Archer’s magic. The celebration of the great British banger runs from 31st October to 6th November, so the Norfolk Nobbler, will go on sale from Monday 31st and remain on the counter at Archer’s Butchers until Christmas. What makes this sausage even more special is that for every pound of sausages sold, £1.50 will be donated to Marie Curie who provide care and support to those living with terminal illnesses, enabling them to get the most from the time that they have left. 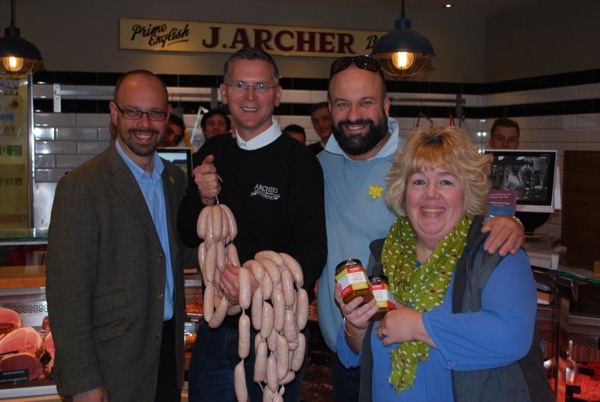 Jamie Archer said “I am delighted that we can support Marie Curie with the ‘Norfolk Nobbler’ sausage. We like to be able to give back to the local community, as the Marie Curie Nurses do such an amazing job.” Candi Roberton said “I am really pleased to be able to support this fantastic initiative. It goes without saying that any sausage from Archers is going to be a good one, so it is really flattering to have one of my most popular chutneys featuring in the recipe! I am also thrilled to be able to support Marie Curie, which is a wonderful charity, doing great work here in Norfolk”. The sausage is also available on the Grazing Menu at Bedfords Bar and at The Street Café on Magdalen Street.